If you think strategy in your organization is a bureaucratic waste of time and resources, resulting in a fluffy set of statements that don’t really matter, leaving you with the same muddled confusion of execution that you’ve always had, this is your handbook for revolution. 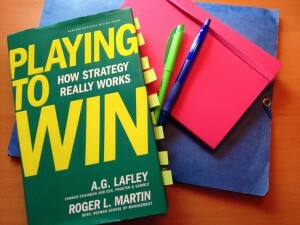 It’s Playing to Win: How Strategy Really Works, by Roger Martin and AG Lafley. I wish I’d read this book years ago. Unfortunately, it didn’t exist – it was published just last year. I suspect the authors wish they’d read it years ago too, since it’s about how their work together and separately on strategy has evolved as part of the enormous shifts in strategic thinking in the past decade or so. But it’s here now, and it’s incredibly insightful and also wildly useful, if it’s applied. Anyone who thinks seriously about strategy should take a look at it. 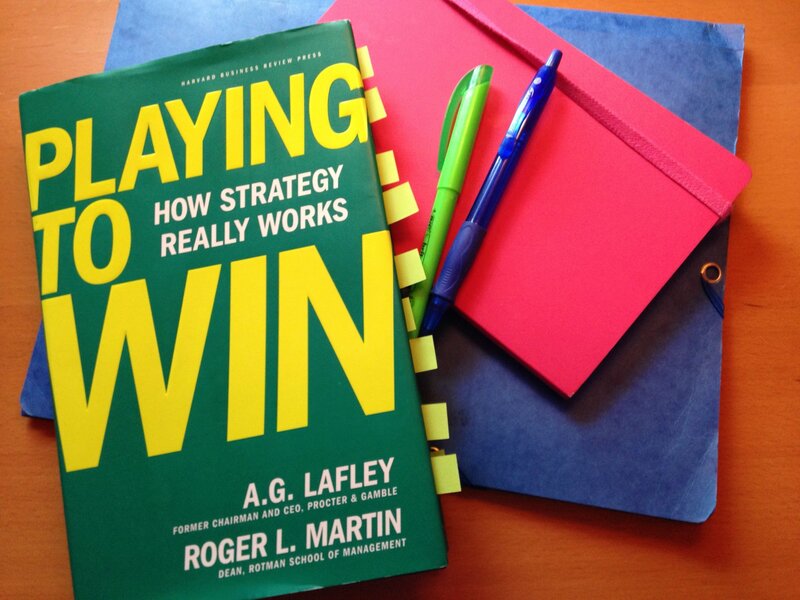 It’s both a how-to manual for doing strategy now, and a narrative of the evolution of approaches to strategy through their careers (Martin as a consultant, later Dean of the Rotman Business School at University of Toronto; Lafley during his time as CEO of P&G, and Roger’s client). What management systems are required? (What needs to support the strategic choices made? And these are all framed as choices – not a plan, a strategy. 1) This is a framework of interlocking choices. And they have to be made iteratively. It’s not a cascade from the top down – the learning and thinking go both ways. Often mission and vision choices are made and then treated as if they’re set in stone. But if those are adequately specific, they are going to restrict you. What if you can’t find a way to win, given these choices about the aspiration? You’d have to go back and rethink your aspiration. This may seem obvious, but in practice, many organizations – large and small alike – don’t have the mechanisms to keep their elements of strategy loose and interconnected. For some organizations, addressing this would amount to reinventing the politics and culture of the organization (this was true for P&G to a great extent). Taking a tight, top-down approach to strategy frequently leads to the “report on a shelf” problem, where mission, vision, and strategy are not connected to the reality of the organization or its environment, which is both a waste of time and creates real peril for an organization that doesn’t actually take on strategy seriously. 2) Massive transformations are possible, but they require time, patience, and focus. Even for a company with enormous resources like P&G, some of the big strategic moves are measured in decades, not months. Strategy is always a challenge of balancing long- and short-term elements, and the stories in this book are a good reminder of how much dedication and effort this requires. All the more reason to be clear and sure about your strategic choices – if they are sufficiently big, they are going to take time. We need to make them so that real commitment is built. 3) The soft side matters. A lot. Despite being rooted in the experience of a global Big Data type of corporation, many of the stories in this book are about individual people and the decisions they made, didn’t make, or could have made differently. Pushing the boundaries of how we define our industry, creating conditions for us to think openly about what good possibilities look like, and bringing all the important perspectives assessments, are all about the personal element of decision-making. Structuring and managing the strategic process is critically important to its success. It’s not just about some right answer floating around in the ether. It’s about helping the people who need to make the decisions find their own way to their own right answers. And in a good process, the right answer typically becomes pretty evident. This would be a great book to pick up if you want a primer on how strategy could or should work – however, bear in mind you may not see it reflected in many strategy practices you see around you (yet). It would also be a fantastic refresher if you have some background in the topic but haven’t kept up with more recent thinking. A caveat: Roger was a teacher of mine, and has been very influential in shaping the way I think about business and strategy. It’s great to see his thinking laid out like this, comprehensively, including the way he developed it (and didn’t get it right the first few times). Michael Bungay Stanier has done a nifty review of this book along with another one, Rita Gunther McGrath’s The End of Competitive Advantage, which is also on my bookshelf – I’ve heard Rita speak and I’m not sure the tensions aren’t resolvable but I’m looking forward to getting into the book itself. And a caution: if you’re in a small organization, some of the book might not feel like it applies to you. While I’d argue that smaller organizations need to be particularly good at making strong strategic choices, some of the methods (analysis, research, internal politics) are going to feel like they’re aimed at a large corporate reader. But I absolutely believe it’s worth the effort of translation, and the need to do that might even be provocative for you – why can’t you do that? Are you sure you can’t? If you’d like to discuss whether we can help you get smarter about your own strategy, please get in touch. And I’m speaking on the topic of having a strategy (not just a strategic plan) at the Greenfield Services Engaging Associations Summit on July 24th. Come join us!